Tantrums are real and they are going to happen. 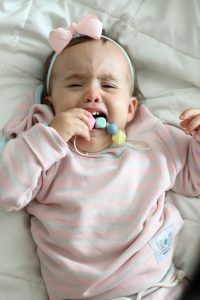 It’s a really difficult time when they start, but if you follow some simple tips and stay consistent you can reduce the tantrums significantly. I’m giving you some of the best tips I’ve gathered along the way of teaching in special education and from my motherhood journey. Toddler life is hard, as you learn you don’t always get your way. 1. Teach your child calm down techniques. Throwing your child in time out may seem great for you but it may not be a long term helpful thing for your child. Plus you will not always have a time out area available to you. Am I saying time out is bad? No, not at all. I’m just giving some other options. If your child it upset, start singing a favorite song of theirs or say, “Let’s count” and count to 10 or 20. This gives your child a method for self soothing when you may not be around, like at school. Isabella is only 17 months old but singing or counting calms her. Also if she is upset because we need to change her diaper I tell her we are going to count. She knows when we get to 10 she can get up. It allows her to feel some control since she knows there will be an end and she can predict it. Do I sometimes count slower if it’s a poop, heck yes! Other techniques can be teaching them to suggest for a hug or snuggle when upset or taking deep breaths. 2. Give back some control. One of the biggest reasons you see tantrums are because the child feels they lost control. Either you are not giving them something they want or you are making them do something they don’t want to do and they have no say. Remember as a parent, this is fine and completely normal. They are not going to have everything go their way in life. So NEVER give in. They will remember that ONE time you did. Give them choices. Giving 2-3 choices allows your child to have some control in the situation. “Okay we are going to change your diaper. You can hold the wipes or your diaper, what do you chose?” Another example: “We are eating at the table right now, you can stay in your chair or sit on my lap.” Make sure the choices you give still get you the end result you want. You must be okay with them picking any of your options. 3. Talk to your child and give warning. Before just changing a diaper, making your child sit for a meal or asking them to clean up talk to them about it. They are human too. Did you know that even with infants you should talk to them as you change their diaper explaining everything you are doing? Yup, remember I’m a birth through five major and I learned this in college. So prepare your child. “In 2 minutes we will be cleaning up.” “When the song is over we will be changing your diaper.” Turn on a favorite song prior to saying this. Start using these tips to help prevent and reduce tantrums. Remember, consistency is key. You may not see huge improvements over night. Great tips! I have definitely found that preparing Isabella with what’s to come helps tremendously! I love number 2! This is also good in teaching them how to make choices….I’ve known teenagers who couldn’t even order food at a fast food restaurant because their parents always decided what they would eat and would order for them. Yikes. Kids need to learn young how to make simple decisions and know how to set boundaries. Giving them little choices while they are young helps this process along. Great ideas, Eryka! Great tips Eryka! We definitely do a lot of singing over here and providing choices to Isabella has been so helpful. 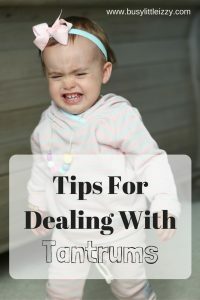 Tantrums are so hard, great tips, especially about being consistent! These are great tips! We are certainly in the stage of toddler tantrums, and I always need to be reminded of things like this! Thanks for the post! Issues. I’m definitely being consistent. Great tips. Number two has been especially helpful. When my bub wants a snack he’ll actually ask me what his options are and I tell him. He then gets to decide what he wants.